The pictures of the women espousing the politics of Enoch Powell, or the Tory peer urging Britain to re-colonise Zimbabwe may seem like social media flashpoints through which we can project a picture of an entire nation in the grip of the dark forces of racism and nascent fascism. But smearing a whole group of people from these ‘moments’ is misguided: the Covington Boys are no more representative of American Catholicism than the No Deal cheering men on Question Time are representative of the city of Derby. People are complex, societies are diverse, countries are confused by regional and demographic variation. But being immune to the signposts of the new right is equally absurd. How do you “shed xenophobia in 2019”? Is there a gym for this? White men writing about racism not really existing is always problematic, but this analysis not only ignores the signs and symbols of racism that people experience in Britain today but it Massie’s own privilege. The reality is well documented. Hate crimes involving racial and religious discrimination soared at an unprecedented rate after the Brexit vote, prompting warnings that minority groups feel “more vulnerable than ever”. Police figures obtained through Freedom of Information (FOI) requests showed incidents surged by 23 per cent – from 40,741 to 49,921 – in the 11 months after the EU referendum, compared with the same period the previous year, marking an unparallelled rise. Eleven of the 32 police forces in England and Wales saw reports of race and faith-based hate crimes increase by more than 40 per cent, with several regions including Gwent, Nottinghamshire and Kent soaring by more than half in a year. Massie’s argument that attitudes to immigration have softened (“something startling has happened: the salience of immigration as an issue has plummeted. Before the referendum, nearly half of all voters (45 percent) named immigration one of the most serious issues facing Britain; now fewer than one in five voters tell IpsosMORI migration is that important”) – is a mute point. It’s a bit like saying that support for UKIP has reduced now that Brexit has been won. Well, yes it would wouldn’t it? Islamophobia, visceral reactions to immigration, people seeking asylum and xenophobia are apparent and very real and emboldened by Brexitland. Home Office figures reported that race and faith-based hate crimes had decreased by 0.4 per cent in 2011/12, before climbing by seven per cent the following year, 16 per cent in 2014 and 17 per cent in 2015 — making the latest 22 per cent figure an unprecedented annual rise. The white columnist tapping away reassuring us that racism doesn’t exist or has just disappeared is a real thing. 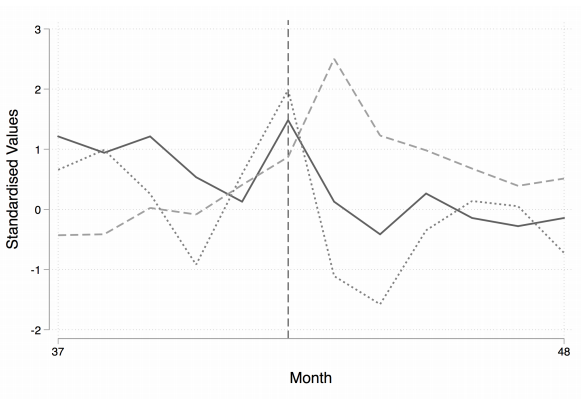 Both salience and coverage of immigration increase before the referendum (during the campaign) and peak during it. Hate crimes follow in July, peaking about a week after the referendum. All three then decline. Since we know the media has a potent effect on anti-immigrant attitudes and right-wing party support, and that events and media coverage have a large impact on hate crimes, it is not implausible that this dynamic of media coverage and immigration linked the referendum with hate crime, particularly if one considers the dominance of immigration and immigrants as an issue during the campaign. Similar evidence has also been found following Donald Trump’s election in the US. The subject merits further research. Since the data used does not include hate crimes against White British individuals (though this is still classified as a hate crime), we can be sure it isn’t a ‘backlash’ effect. You can read his full study here. Of course you don’t need an academic study for validation of your experiences if you’re beaten up, threatened or your friends or family are deported. You don’t need a CapX article explaining that none of this is really happening if you are an EU national living in the Britain being charged and pressured to leave – or if you are an MPs staff barricaded into their offices by the English Defence League (EDL)’s thugs – or if you are one of the minorities who experience the surround-sound of tabloid racism day in, day out. There’s no place for a smug complacency about racism or the rise of fascism. Building solidarity and resisting racism has to start by acknowledging its existence. Therbbbe isn’t much racism or Brexit fever round where I live. I’m not a competent facebook user, and I recently gave someone an accidental ‘wave’ on facebook, possibly the result of a fat finger error. If I wanted to send someone another ‘wave’ I would plan to set aside a whole afternoon to learn how to do it. 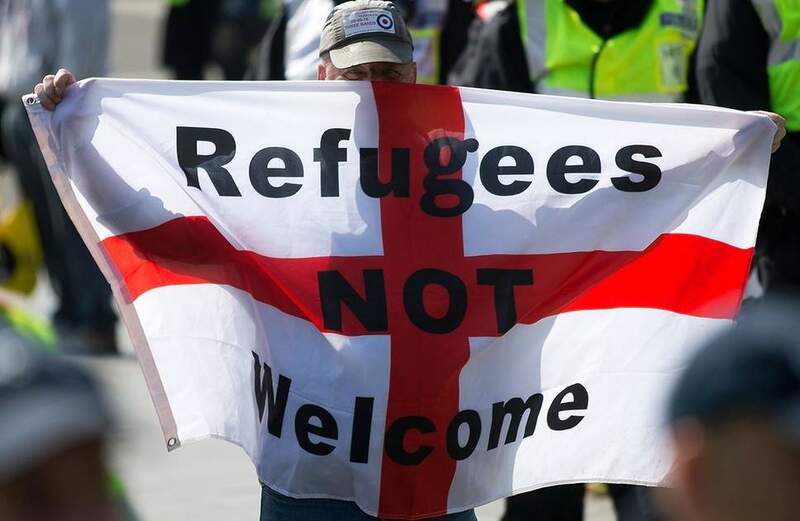 Anyhow, both the user I waved to, who is Rothesay’s Syrian Barber, and his contact, another member of the Syrian refugee community, prominently display on their facebook pages an image of the Saltire. Nationalists might like to think about that in relation to Alex Massey’s piece. I’ve noticed that Scotland is different from England in many respects. I’ve even met some people who think it is enough different to benefit from being a different country. It’s always been like that. They’ve just become so arrogant/deluded/desperate that they can’t be bothered to maintain the pretence any more. I suspect that if people are saying immigration is less of a pressing issue now, it’s in large part because they believe it’s been or is being solved. Brexit has been achieved and now all the dirty foreigners are going to be sent home, or at least denied their rights. It’s like saying that Suffragette activity declined rapidly after women got the vote. It didn’t mean nobody cared about it any more. It just meant folk didn’t feel the need to make it their top concern any more. The issue of inequality in our society has not gone away. Under the Tory austerity regime it has got worse. Theresa May’s “hostile environment” for illegal immigrants led to an hateful environment directed at those who had a legitimate right to be here and who were making a positive contribution. Those who suffered the greatest inequality saw in the Referendum an opportunity to express discontent. Sadly it also lead to the rise of Hate. Boris and Farage led that charge. Anecdotal evidence from friends who live in Thetford recorded a rise in antipathy and aggression directed at the large Polish community there. Now we have the Polish Government asking Poles to return home in order to build the Polish economy and a major turkey farmer in Norfolk bemoaning the fact that his business may fail as he cannot replace the many Polish workers who have kept him going over the last 15 years. Seemingly Brits do not want the jobs. Thank you very much Mrs May. I accept that for some the Referendum was job done and the immigration issue is no longer the prime focus however the reports of activity round Westminster and other locations would appear to indicate that the right wing is on the rise, hate crimes are rising, people are in fear of their lives and that racism and fascism are alive, well and thriving in Britain today. My feeling is that the problem is greater in England than in Scotland and the English attitude to Scottish independence is conditioned by that process. The idea that fascism is rampant and racism is rampant in England is risible. Why would so many non-whites choose to emigrate to this alleged cesspit of bigotry? PS Any comments on recent developments in the Venezuelan Workers Paradise ? There is evidence of racism in the attacks on non Brits, both black and white others. The jailing of the couple who were members of a banned organisation and the action of Gerald Batten in allying UKIP with the far right – with Neo nazi affiliations is surely enough to cause concern. I hold no love those of the left or right who act in a despotic authoritarian manner. However as I do not live in Venezuela, nor ever intend to go there, while I might despair what bis happening there, I feel that there is little that I can do about that situation. I am concerned about the rise of hate crime and racism in this country. Ask those who have come here if it is all sweetness and light. I dont think you can have read the article?